EME Certification is dedicated to organizations that demonstrate compliance in relation to the implementation of Environmental Management Systems according to ISO 14001. EME is a systematic approach to manage your organization's impact on the environment by implementing essential requirements with less guidance from management - without neglecting the importance of ISO 14001 core. 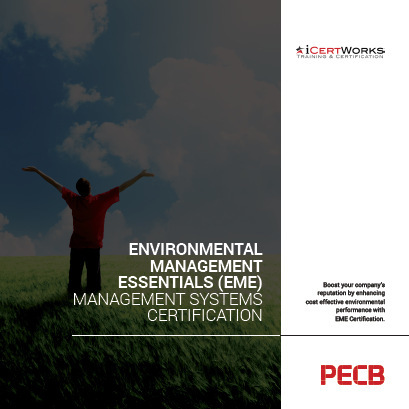 PECB's EME framework implementation and certification will demonstrate your devotedness to plan, implement and review environmental impacts with cost effective outcomes. EME certification (also known as "registration") is granted by a third-party, such as PECB, upon verifying through an audit that the organization has fulfilled the considered essential clauses. This certification is maintained through scheduled annual surveillance audits by the registrar, with re-certification of the Environmental Management System performed on a triennial basis. For more information on EME Certification, please fill out the form on the right side of the page. Contact us about EME Management Systems Certification! Looking for ISO 14001 Certification?